Songs about girls and getting out of one’s hometown are probably the biggest cliché in pop punk, apart from eating your body weight in pizza, of course. It could be argued that New Jersey quintet Man Overboard are the pioneers of the genre’s revival in recent years. This could be accredited to their “defend pop punk” mantra or seemingly effortless ability to write pop punk anthems as shown on 2010’s Real Talk or their self-titled album from the following year. A good way to describe new album Heavy Love is “more of the same”. This is obvious from the word go, with opening track Now That You’re Home displaying lyrics about young love as showcased by dual vocalists Nik Bruzzese and Zac Eisenstein. In fact, the majority of the tracks are about, you guessed it, girls. Splinter is packed with heartfelt lines such as “she’s asking how’d I let everything get so nasty?” giving the song a juvenile yet endearing feel. The track also includes another aspect of Man Overboard’s go-to songwriting formula – massive choruses, something they mastered years ago. It is clear that the quintet have fans in mind with these tracks, with a lot of them including gargantuan singalongs. This is definitely true in Borderline’s case, as it not only has a massive chorus, but the charmingly self-deprecating “I guess it’s just like me to get real sentimental before I leave” refrain. Due to most of this, there is definitely no confusing Heavy Love for anyone else’s album. Although most of the record is pretty much a generic Man Overboard album, there are hints of branching out. Anything includes a mishmash of as many different tempos as possible, as well as acoustic parts, surprising in a mainly electric song. She’s In Pictures starts off well, with an almost surf pop-like intro transitioning into heavy (for Man Overboard, anyway) guitars. However, things fall flat as the song continues – a shame from something that started as so promising. Thankfully, not all developments fail to be pulled off. She’s In Pictures is followed by album highlight Invisible – a ballsy, fist-pumping banger combining the aforementioned pseudo-heavy guitars with a rumbling bass line and a chorus that will be stuck in your head for days. This is a stark contrast to the couple of completely forgettable songs featured on the album like penultimate track For Jennie, where the go-to formula begins to grate and Cliffhanger, which includes double-time drums paired with an immeasurably quick tempo, making the song seem too frantic and without meaning. 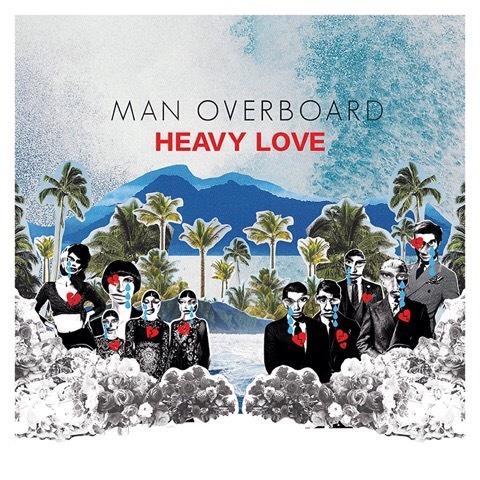 Heavy Love is a Man Overboard album; there is absolutely no doubt about that. Previous efforts like their 2011’s self-titled album and 2013’s Heart Attack have become like bibles for lovelorn pop punk fans, setting the bar high. Heavy Love does not stray far from the path. However, the issue is that while all of the ingredients are there to make this a classic album for the band, it falls into the shadow of its more consistent predecessors. While there are some tracks on Heavy Love that are set to become pop punk classics and keep existing fans sweet, some are arguably too generic to stick in memories for too long. Man Overboard do not seem to have developed much since their last full-length. For now that’s fine. But fresh ideas may be needed next time to ensure listeners will continue to defend pop punk. ‘Heavy Love’ by Man Overboard is out now on Pure Noise Records.